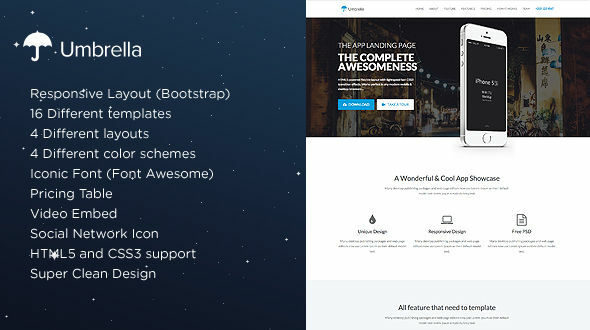 Umbrellais a Responsive HTML5 One Landing Page Template. It has 4 different layouts on banner and 4 different color schemes. HTML5 powered flexible layout with lightspeed fast CSS3 transition effects. Works perfect in any modern mobile & desktop browsers. It also have nice and clean layout design. Umbrella divided into 7 sections : Banner, About, Features 1, Features 2, Pricing Table, How It Works and Our Team. We provide lifetime updates and support via email support support@psdbooster.com Feel free to make a request. We do replying all requests and trying to help everyone with what we can. All the images shown on the Umbrella demo site are meant for demo purpose only. In the template packages we provide image placeholder instead.